Use a selection of fruit you enjoy – there’s very little doesn’t go with chocolate! 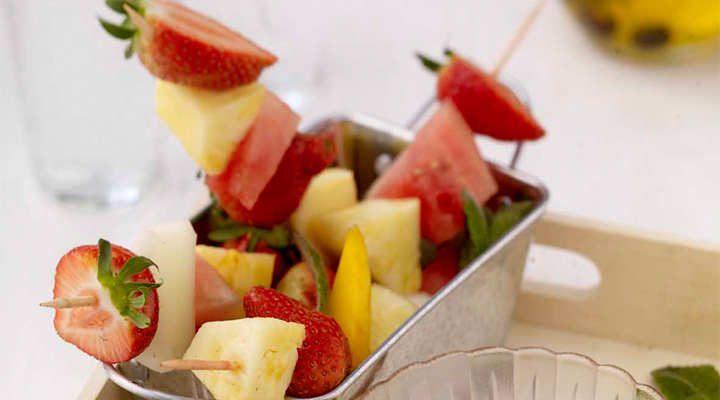 Prepare the fruit in a large bowl, then thread the fruit onto each skewer, approximately 6 pieces per skewer. Place the chocolate pieces into two separate bowls, the white chocolate in one bowl and the dark in the other. Pour the cream into a small saucepan and bring to the boil. Remove the cream from the heat and immediately divide between the two bowls, stirring continuously to combine and ensure the chocolate is smooth and all lumps are removed. Dip the fruit into the chocolate bowls, you may use your fingers if like!